An averagely priced and latest mobile phone will have inbuilt email software for accessing Gmail, Yahoo, Hotmail and other mailboxes. In some cases, it can be retrieved from the mobile operator of the customer. Otherwise mailbox settings should be manually entered to send and receive email messages. Before creating a mailbox setting in a phone, we have to provide IMAP and POP access in web based Gmail account. Open Gmail> options and move to forwarding and POP. Here select enable POP and IMAP and save settings. POP and IMAP should be enabled in Yahoo, and Windows live Hotmail options- for creating corresponding mailbox in mobile phones. This setting will allow email clients like Outlook, Thunderbird, Symbian email client, etc. to access and retrieve email messages from the Gmail, Yahoo and Hotmail inbox. Now we are going to create a mailbox in Nokia phone. Open up messaging and select settings. Click on email settings and select to create a new mailbox. Select mailbox type as IMAP or POP. Both settings are available in some devices. Select POP access and enter the required Gmail address. Enter the incoming mail server as POP.gmail.com and outgoing mail server as smtp.gmail.com. Now select an access point and name your mailbox as Gmail. For email services like Yahoo, Sify, etc., you can use automatic retrieval of settings, which is provided by the mobile operators. Open tools section in Nokia phone and select settings wizard. Follow the wizard driven procedure and you will be able to apply the selected mailbox settings in 1 minute. SIR, MY MOBILE IS NOKIA N73.FOR PROBLEM OF JOYSTICK, I TOOK MY MOBILE TO THE NOKIA SERVICE CENTRE WHEREIN MANY OF NOKIA COMPANIES SOFTWARES WERE DELETED BY KNOWINGLY OR UNKNOWINGLY BY THE NOKIA PEOPLE. SETTING WIZARD , EMAIL OPERATOR ARE ALSO DELETED. MY EFFORTS TO RECOVER DELETED SOFTWARES FROM NOKIA DEALER AND NOKIA COMPANY ARE ENDED IN SMOKE. I AM TOTALLY UNSATISFIED WITH NOKIA SERVICES TO ITS CUSTOMERS . NOKIA SERVICE IS ONE OF THE WORST SERVICE AND NOKIA , HAS LOST ITS NAME AND FAME BECAUSE OF ITS BAD DEALERS AND VEERY WORST SERVICE CENTRES . 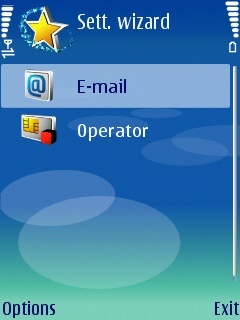 SO WILL YOU HELP ME TO GET THE SETTING WIZARD,EMAIL OPERATOR FOR NOKIA N73? SOLICITING YOUR POSITIVE FAVOUR AND NEEDFUL ACTION AT AN EARLIEST POSSIBLE TIME AND OBLIGE. WARM REGARDS , SHRIKUMAR.